Barbie: The Princess and The Popstar was produced in 2012. A perfect Barbie movie for kids. The message of this movie is clear, it as everyone to be happy with what you are. Accepting what you are will make you all happy even that there are always a lot things that you would want to change. Enjoy this great movie and let me know your opinion about it. How to Watch Barbie: The Princess and The Popstar (2012) Barbie Film For Free No Download, No Surveys and 100% Free? 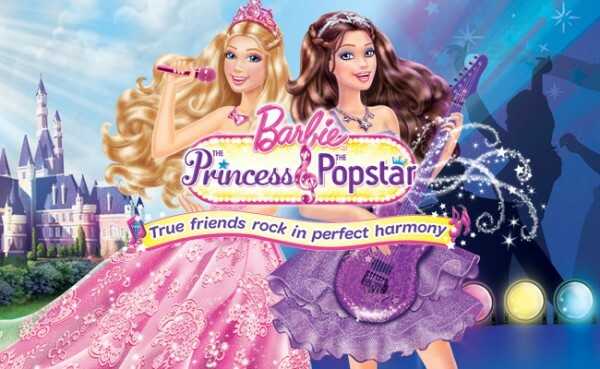 Click on the arrow button at the far bottom-right corner of the video player (stream) to play Barbie The Princess and The Popstar (2012) full film at full-screen size. Please let me know via comments if the stream is working or not. 80 Responses to "Watch Barbie The Princess and The Popstar (2012) Movie Online For Free in English Full Length"
I am glad to hear that you like the blog. Barbie in the Pink Shoes (2013) has been added to the list. I love this blog. It has enabled me to see movies I loved but haven't seen since I was younger. I love this blog so much! The farthest I have been able to get in this movie is 3 minutes though. It works fine here on my iPad not sure why it doesn't on kindle. its works...but could you add english subtitles for people with hearing problems? thanks! Great!! It works for me! But isn't this illegal??? Posting movies like this? i love this blog and it worked fine like always. i am 22 and i still watch barbie. thanks for this great site. it was a little slow!!! Why you removed it ??? can you put it back up pretty please? I couldn't find the full screen button, but the movie worked great! Thanks! Enjoyed watching!! Thanks for the video when i ever try to find another one it will always be barbie life and a dream house. But i already watch them all. It tries to load for like five minutes and the it tells me that the request timed out. Please try and find a way to fix it. Thank you!!!!! the movies are blocked? know why? It keeps making me rewind to watch. This movie reminds me of Barbie: The Princess and The Pauper, especially the song "To be a princess"
u are welcome. Thanks for your comment. it is not the full during the first song by kira it stops!! why?! I love how they redid the balcony scene from "The Princess and The Pauper" in the song "I Wish I Had Her Life" but it was a different song and during the day. I lived how they brought elements from the other Barbie movie into this one. Have you guys noticed that when Tori sings "Here I Am", she's really nervous at first? That's because she didn't have the experience and training that Keria had. Well, she can sing, but every princess is bound to have music and singing lessons sometime in her life. Anyway, Keria had been performing since she was six, and doing big shows every single night for the past two years before she and Tori met, so she knew what it was like. She even knew, it seems to me, that she could get nervous just like Tori did on the stage. But I loved how she said, "Just do it your own way", when she saw Tori start singing with the acoustic guitar because she was used to that. And toward the middle of the song, Tori gets more used to singing on the stage, and blows them all, including Keria, away. This is an amazing website! The streaming is perfect for me. It all works really well, and the film was so cool. Anon, I have added a new stream. Please try again and confirm if it's working or not. Anon, it works fine here. Please refresh the page and try again. The To be a princess song at 29:36 on this movie is just like the one at 33:44 on the princess and the pauper. I love this site! Whenever I try to go anywhere else for a barbie movie, it's barbie life in the dreamhouse!